We’ve been working with the furniture we’ve had for 5 years now. 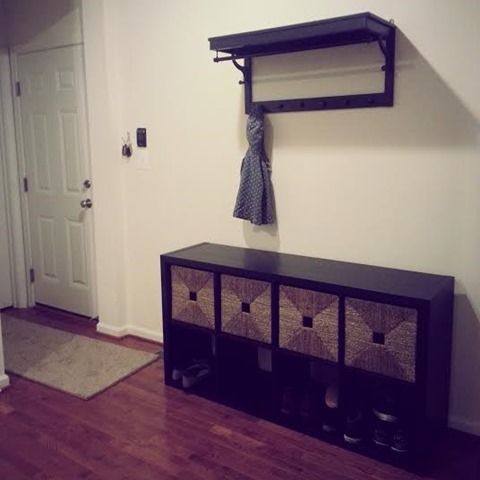 I cannot tell a lie – it felt so good to get new furniture. Nothing has been sold, thrown out or donated. We’re keeping all of our old stuff, just repurposing it. I love making our additional bedrooms and living spaces more homey by adding some extra pieces of furniture. So here we go! 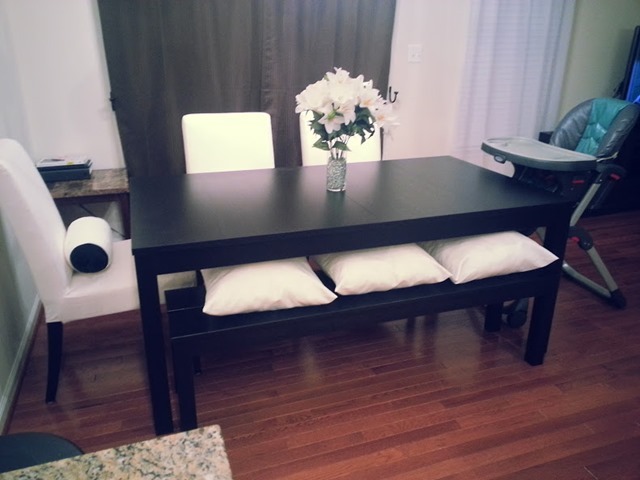 Our first dining room table was bar height. Perfect for us, but it’s truly taken a beating over the years. We decided to go with something bigger, something that could accommodate let’s say, Christmas dinner perhaps? And of course, normal height. This seemed to fit the bill. We’re picking up another white chair for where Sophia’s high chair is, but overall I’m in love. It expands to fit 8-10 people. Best part? Seat covers come off and are machine washable. Stop the madness. Yes, you can have white furniture accents and a toddler. Win. We didn’t have a dedicated space for our shoes before, just your typical carpet runner to pile them on. Our jackets went in the front room closet, hats on an over-the-door rack, and that was it. Now? We have plenty of room for shoes, bags, guests’ jackets, all of Sophia’s shoes, scarves, gloves, and even reusable shopping bags. It’s perfect. It’s functional. It works amazingly. Just, love. 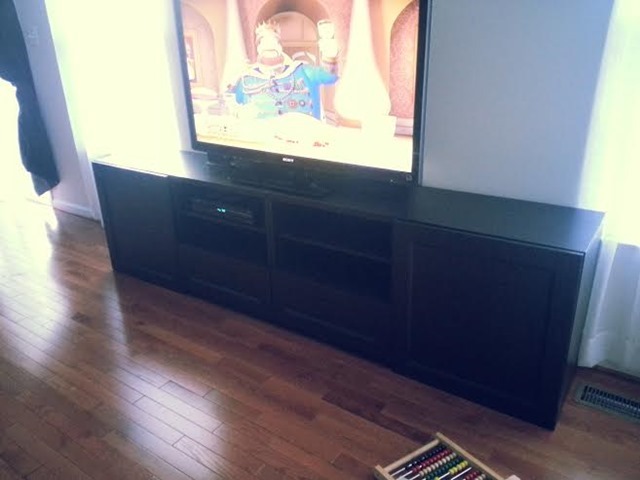 Last new piece of furniture (thus far) is our entertainment center. It’s also taken a beating, with this last move being the worst. The support leg in the middle of the stand broke off, and now it was bowing. Not good. Also, Sophia loves to throw things under the TV stand and yell, “Uh oh!” then looks at you like, “Get over here and get this before I throw something else under there”. At least she says thank you after I get it for her, but that’s besides the point. Top on our list was a TV stand that was completely flat on the floor. No dealing with toys underneath, or bowing issues down the road. Storage for sure, ideally with a couple drawers. So, we agreed on this bad boy. Also, ignore the abacus. Sophia grabs it and we practice counting every day! She gets the most excited when we get to number seven. So this is actually two separate stands, that we built to make it appear as one. Its sleek, it’s modern, it’s been child-proofed, and it works so well for us. It’s also a bit higher than our old one so it prevents the little miss from putting her fingerprints all over the screen. So that’s it so far! We still have some more main floor updating to do, and of course other floors as well, but that’ll be done in time. What’s your favorite room to decorate?